In my beginner Music Tech class we’re currently working on House music in Ableton’s Session View. A key component of the project is generating tons of descendent clips from one original clip. The idea was originally to use an old technique as inspiration – the TB-303 bass machine. In the 1990’s, a lot of electronic music was very repetitive, and changed timbre more than it did notes or rhythmic material. This is because those patterns were tougher to change and generate than the timbre changes one could accomplish by turning a knob. This is also the first project we make in Session mode. I want this strange-looking view to feel accessible and uniquely useful, so clip duplication is a pretty good starting point. In our song, we start with a very simple bass pattern. I like to use the opportunity to show what a monophonic instrument is and how the notes interrupt each other rather than playing chords. In our example, the students generate the part by locating two octaves of a note with our left index finger and right index finger. When we press the circle to record a clip, we “park” our left hand on the lower note, leaving it unchanged while simultaneously “interrupting” it with the higher note. To create more interest, we allow the higher note to drift a bit to nearby keys. After a quick quantize (cmd-U) the result is a cool alternating bass pattern. 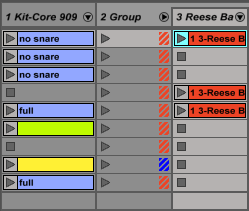 I then have students add more instrument tracks to the set – one of each synth category (Pad, Keys, Lead, Rhythmics, etc). We then copy the initial bass recording onto the other tracks. Each time we will adjust the octave (in the Notes box, simply type “+12” until it’s in a good sounding octave for that instrument). After a few other steps involving form sections the Session view ends up looking like this. Notice – the red clips are all the same exact clip, possibly octave shifted. There are also drum clips and sound effects to help with transitions between scenes. When the song sections start coming together, we record the song scene-by-scene into the Arrangement view as a linear, finished song. Those are just the technical skills though – the real fun of this project is learning about House music and how to build up and drop and all that fun stuff. Here’s what the finished project sounds like. Keep in mind this is a project for beginners who have only been making music for about 8 weeks, and it totally works. Let me know what you think!